Fans of Douglas Adams' Hitchhiker's Guide to the Galaxy - your long wait for a successor is over! The fate of the world lies with one man: Bip Plunkerton. Talentless scientist and frequent drinker at the Empty Goat, young Bip Plunkerton will follow in his father’s footsteps as a volunteer...footsteps that have yet to return from the wilds of the wide world outside. Traverse the harsh weather of the formidable ice plains, navigate the boiling sea, and suffer the ravaging heat of the bone desert. Bip’s impossible task, continually thwarted by the semi-corporeal Mr. Random, is to warn the rest of the world of the coming doom of the Massive Ball of Death hurtling through space. Will the last volunteer be any more successful than the first? Will Bip save planet Bersch from a fate set into motion millennia before? Probably not, but we can likely drag this question out for a couple more audiobooks, though. Right? I had read this book before the audio, but it is even better in audio. I can not wait for the next book to come to audio! An amazing book with the perfect choice of narrator. One of the first audiobooks I listened to was The Hitchhikers Guide to the Galaxy. The writing style you have for it captures a lot of the feel and the narrators cadence and technique does a lot to add to the experience. It is kind of like listening to a favorite book again for the first time. The style of writing reminds me of Neil Gaiman, Terry Prachett, and Douglas Adams with a touch of Guy Ritchie for the seedy back alley characters that are just awesome. Thanks Steve, can't wait for more! A good fun read. The narrator brings a touch more mirth with his tone. A bit science fiction, a bit fantasy. You can feel the loving influence of Terry Pratchett. There is absolutely beautiful world/universe building that I want to see more of. I can't wait for the next one to come out! So this is definitely a humor-driven book. It kept a smile on my face basically the whole time I was listening to it. From the Yeti trying to boil the main character for dinner to the immortal, but not immune to damage, "hero" that jumps off cliffs to save time. If you want hard Sci-Fi this isn't it, but if you want something that will keep you chuckling and smiling all day long this is what you're looking for. In all seriousness, this book is a riot, completely ridiculous and I loved it. I really enjoyed this book, it very much reminded me of Hitchhikers Guide to the Galaxy, in that it was very funny/ridiculous and also had an interesting story involving aliens. I find the Magic/Science system pretty interesting and want to see how Bip progresses with it in future installments. The overall story is interesting with the Present Day story of Bip and his journey being told concurrently with the past story of Handen Strike and his journeys keeps things fresh. It was a bit short and seemed to end a bit abruptly but that just leaves me waiting for the second part. The author C.C. Hogan was a great choice, he has a great voice and did a great job with the humor and comedy in the book. I loved the humor of this book and the heroes the author created. I enjoyed how the story flipped from past to present to where exactly are we again. If you enjoy the writings of Christopher Moore, Douglas Adams, and the like, you should definitely give this book a go. If you listen to the podcast of Authors and Dragons you'll find that Brandon Thighmaster is one hell of a writer. I wish the narrator created more distinctive voices for all the characters but that would be my only complaint. I enjoyed listening to C.C. Hogan regardless. I usually use my credits on books 30+ hours long, but I've familiar with the authors brand of humor from his works in the Shingles series and from the A&D podcast. I was not dissatisfied. While the style was a bit out of my comfort zone, I really enjoyed the book. The narrator was great, and I can't help to feel that the experience was bettered by his contribution. If you like funny Science Fiction / Fantasy stuff, like say Hitch Hikers guide to the Galaxy, give this book a shot. Steve rolls a natural 20! This book, and it's audio performance, is one of the best in recent memory. Steve gives his own unique spin to a fairly common sci-fi trope and makes it wholly engaging. The story is jam packed with action and humor. If my headphones didn't die, I would have listened to it start to finish in one go. C.C. 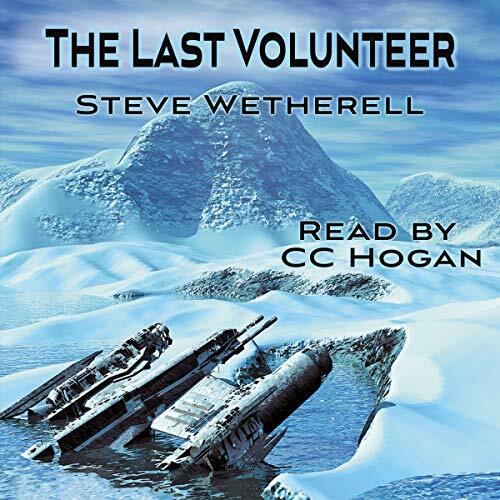 Hogan's narration makes an already great book even better. I'm struggling not to go on and on, and risk spoiling plot details, so I'll just say... GO LISTEN TO IT!